Below: I think this sketch of the blade for the original first pattern knife is remarkably like the antler handled knife in the photo below. This blade has a broader profile than the typical straight tapered First Pattern knife. Since they were all hand ground from forged blanks, all different tapers and lengths are found among the surviving knives. Below: The purchase of this antler handled knife certainly makes me ponder the true evolution of the First Pattern knife. The knives' ricasso are the same width and thickness as the traditional First Pattern, to within a few thousandths of an inch. The obvious difference is the taper of the blade on the bottom knife is much less pronounced. The blade on the bottom knife is also 1/2 inch longer. 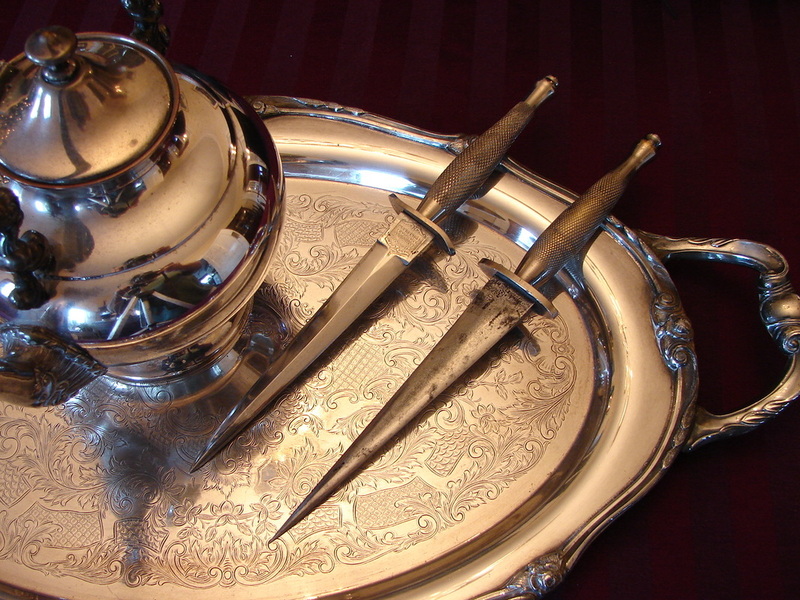 Knives, like the one with the antler handle, were made in the 1800s by many British companies. No doubt forging dies existed for forging these blades out. 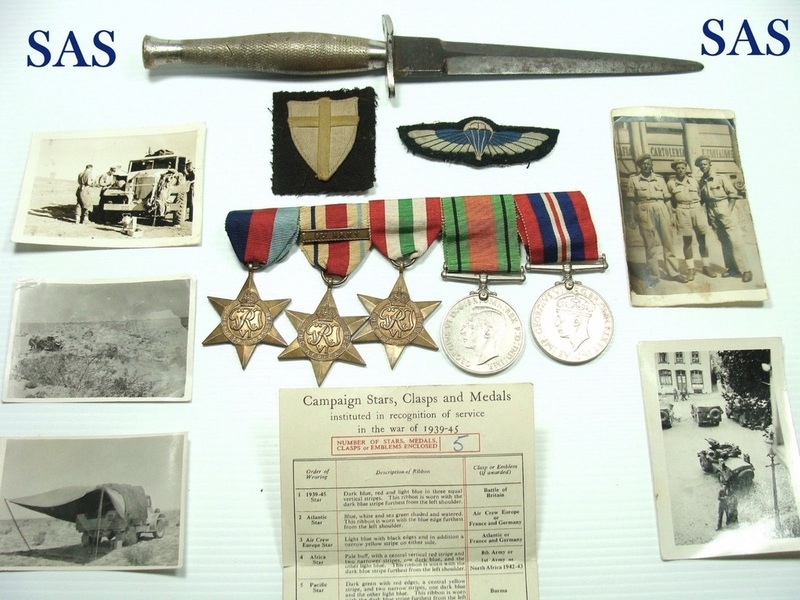 Below: An exciting new ensemble of medals, patches, photos, and a Wilkinson first pattern knife. The owner's name has been forgotten or lost over the past 70 years but he was a member of the famed SAS. He served in Africa with the 8th Army and the LRDG (Long Range Desert Group) and in Italy. I have no clue why the handle has been shortened and won't know (until it arrives) how it is held on. If you have any information on any on the men in the photos please email me. I will post larger photos of them once they are in my possession. As we often lament, if only the knives could talk. By the way I bought this from John Fisher who is a great guy to deal with. Unlike this knife, his stuff is usually pristine. Thanks John. Below: Here is a splendid example of my investment in Precious Metals. The two center ones are the rarest and the most valuable. Tea Anyone? My Paul MacDonald First Pattern beside our first X-Dagger from England. The Fairbairn Sykes knife was not designed as a hunting knife, for the elite chasing game, nor for thugs knife fighting in dark alleyways. 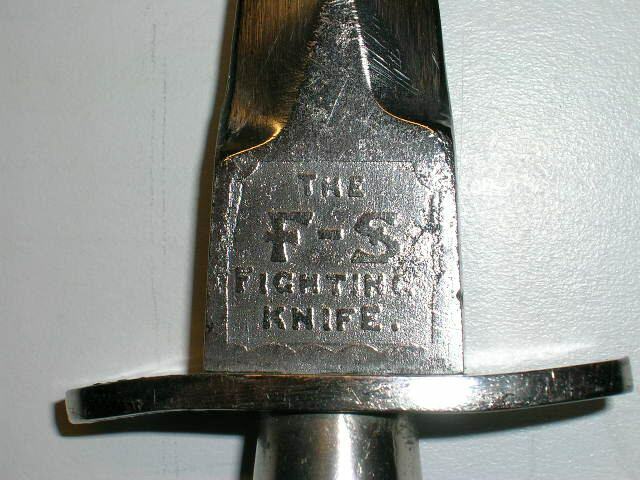 The F~S was designed for warriors who were hunting men and who were taught the techniques of silent killing. When I first started collecting F~S knives the production numbers for P-1s were often quoted as being in the range of five hundred to fifteen hundred. Some estimates now put those numbers a bit higher, but they are still very rare compared to the second pattern and the third pattern knives whose production numbers are in the hundreds of thousands. 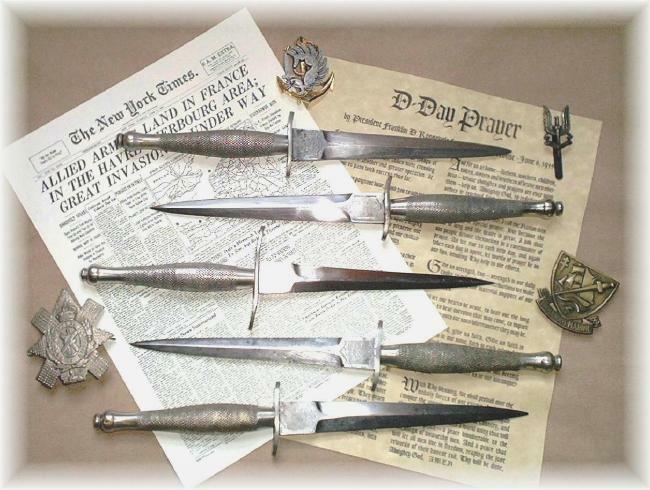 Sadly, as we lose more and more of our WW-II veterans new knives emerge from years spent hiden away in foot lockers or chests of drawers, tucked away in sea bags or closets. Production of First Pattern knives started in November 1940 as a compromise between the Shanghai design, proposed by William Fairbairn and Anthony Sykes, and earlier daggers produced by Wilkinson Sword Co. Blades for First Pattern knives were hand-forged and hand-ground and therefore they vary widely, from blade to blade, both in taper, length, and thickness. For the most part they range between 6 1/2 to 6 ⅞ inches long, one inch wide at the ricassso, and between 0.180-0.200 inches thick at the ricasso. Some of the blades are thickest part way down the blade. In a nation desperately struggling for survival in the firestorm of a world-wide conflagration, we might expect that uniformity was of less concern than speed of production. Despite the demand for ramped-up production, each Wilkinson knife was hand-crafted as if it were destined for a display case not a battlefield. 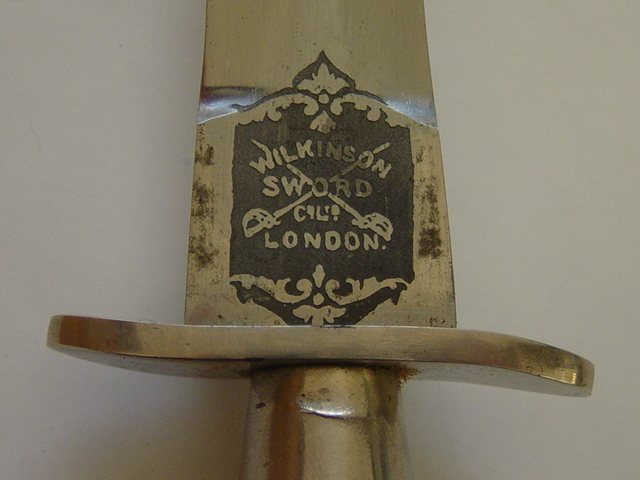 The square ricasso were crisply etched with the Wilkinson Sword Co. and the F~S logo. The blades were well polished and sharpened. Graceful “S” crossguards of nickel plated steel were then painstakingly hand-fitted to the ricasso and tang. The Coke™ bottle shaped handles (really more like a bowling pin) were lathe-turned from brass stock, knurled, nickel plated, and slid over the tang. Then all of the pieces were held together by a nickel plated top nut. The remaining tang was peened over to ensure that the nut would not come loose. Owning an original Wilkinson Sword First Pattern F~S remains the Holy Grail for most collectors of British commando knives. 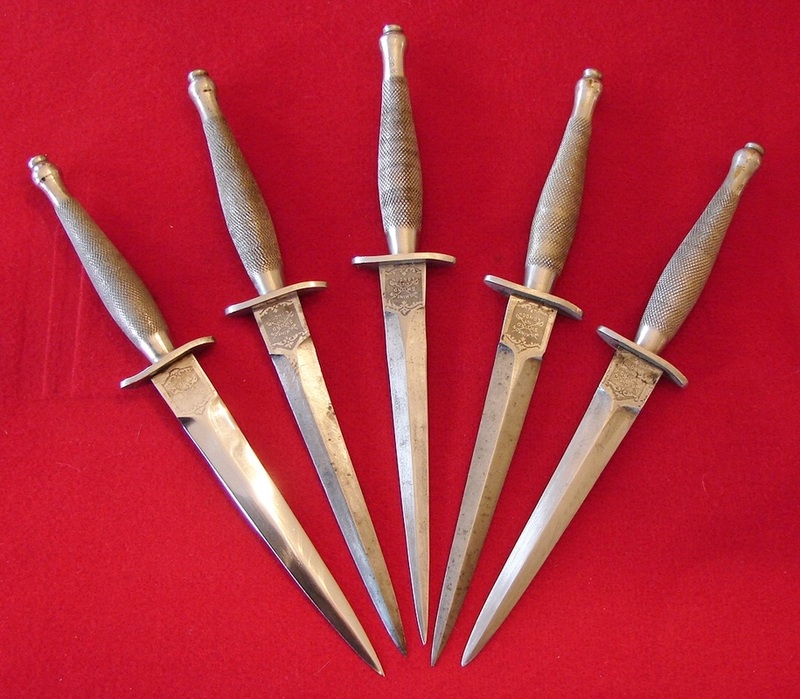 If that is beyond your means or opportunity then the very highest quality reproductions of First Pattern knives are made by Peter Parkinson and Brent Sandow of Auckland, NZ and Paul MacDonald of MacDonald Armouries in Edinburgh, Scotland. Products by any of these men are the equal of the originals in what I consider the four big Fs; Form, Fit, Finish, and Function. In recent years companies like Wilkinson Sword, H.G. 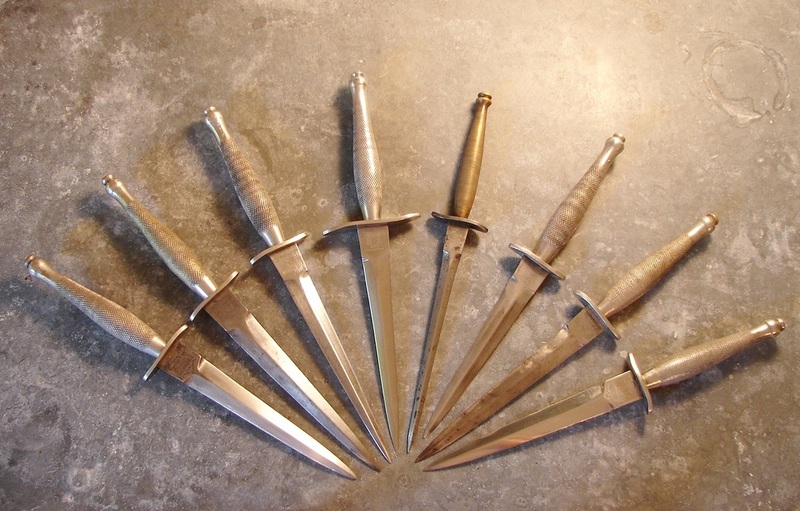 Long, Joseph Rodgers, and others have attempted to reproduce First Patterns knives. Disappointingly, none of these replicas have matched the quality of those war-time knives. Other versions, originating in strange and unknown places have, by the crudity of their manufacture, been exposed as obvious fakes. For one thing, usually the etching of the logo is noticeably too deep, and clumsy. Some have been so badly done that the spelling of the Wilkinson name is incorrect! Therefore be very cautious when buying a P-1 to ensure that you are getting the real deal and not an expensive counterfeit. Every model to follow the P-1s was a small step down. From the first to the second to the third pattern, each one lost something of the essence of those first few hundred knives. I have been extremely blessed to have a wife who accepts my expensive hobby and also for the rare opportunity to be the caretaker of several original P-1s as pictured above. Production of the P-1s came to an end in August of 1941. Below: Here is a spray of original WW-II First Pattern Fairbairn Sykes. All made by Wilkinson Sword Co., you can see the differences in the hand ground blades and even the curvature of the "S" guards. My favorites are the ones with the narrower, more heavily tapered blades like the center one. The difference is in the "feel" which is something that obviously cannot be described but must be felt.